In digital TV, the picture is compressed using the well-known MPEG-2 format, before being broadcast as digital data stream (MPEG2 transport stream - MPEG-2 TS). MPEG-2 transport streams are part of the MPEG-2 standard, but most tools cannot directly handle transport streams as its structure is different from MPEG-2 elementary streams we use on DVDs or SVCDs. This is where Project X enters the picture. It works like an MPEG-2 TS hardware decoder, splitting the transport stream into its components (MPEG elementary streams like audio, video, and other data (e.g. teletext)). While splitting the transport stream, Project X also checks the stream for errors and synchronizes video and audio. If Project X converts the transport stream to another format, it won't analyze and fix streams as thoroughly as in split mode. 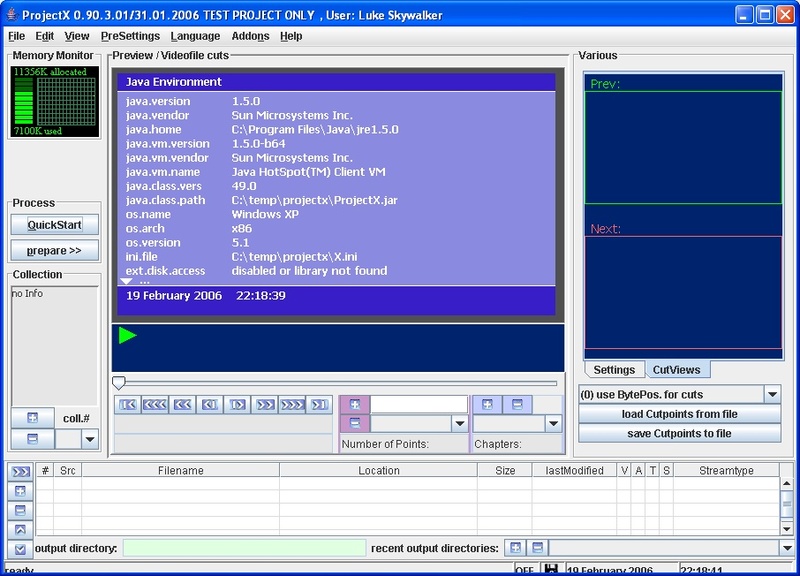 Project X is an open source project for educational purposes and testing. It is written in Java (hence the look), and distributed as source only so you have to compile it on your own, or download a compiled version from this very site. You can use Project X in GUI mode, or via CLI (commandline, if you don't know what CLI is you'll probably never use that mode).